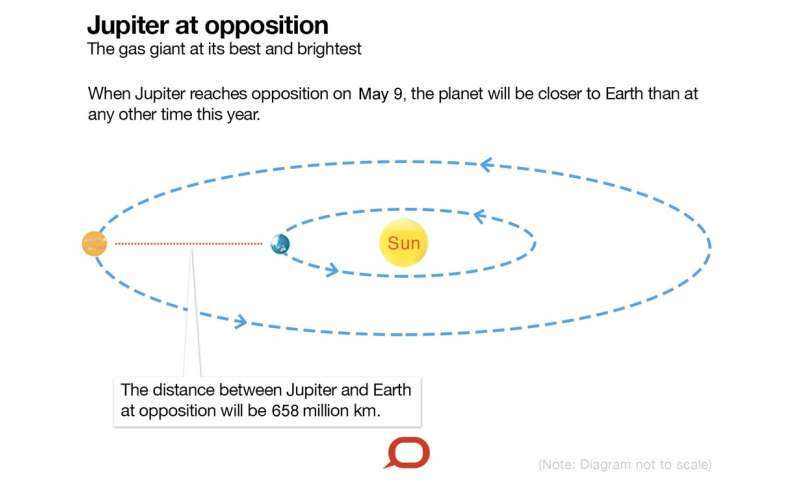 Opposition means that Jupiter sits opposite the Sun in the sky. 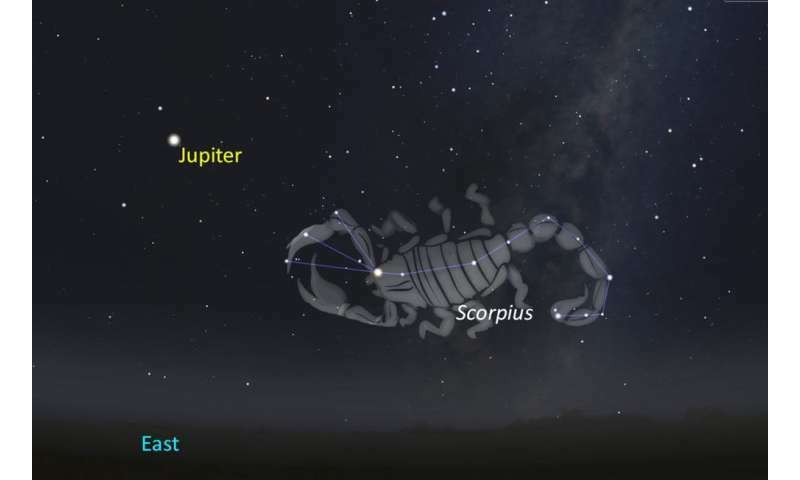 So tonight, as the Sun sets in the west, Jupiter can be found rising in the east. It's lovely and bright, outshining all the stars of the night sky. Also catching Jupiter at its best will be NASA's spacecraft, Juno. After a five-year journey, Juno entered orbit around Jupiter in mid-2016. It's the second spacecraft to orbit Jupiter (after Galileo in 1995), but importantly it's the first to orbit Jupiter's poles, allowing us to see a part of the planet that can't be seen from Earth. Juno has shown us that Jupiter's colourful bands – the clearly defined belts and zones (the dark and light bands, respectively) circling the bulk of the planet – give way to a striking configuration of cyclones at each of Jupiter's poles. 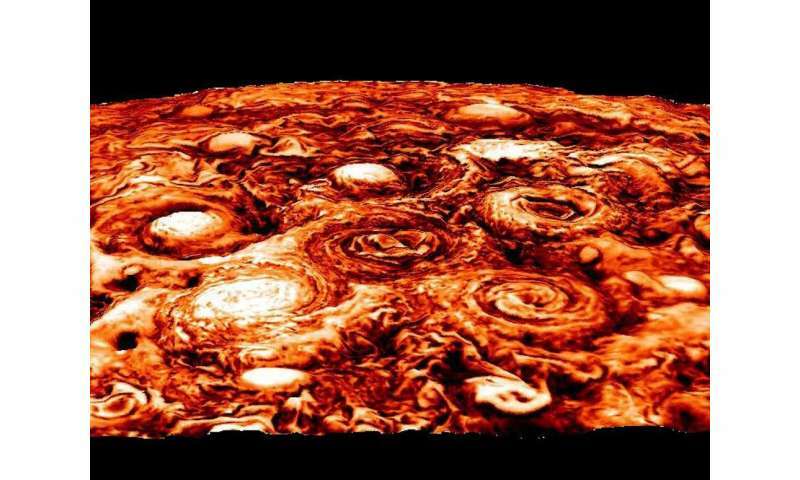 Discovering cyclones at the top and bottom of Jupiter is not completely unexpected, but what's surprising is their stability and the patterns they have formed. These cyclones are huge – the southern ones range from 5,600km to 7,000km in diameter; that's about as wide as Mars. The northern ones are slightly smaller, with diameters of around 4,000km to 4,600km. The wind speeds are as great as 350km per hour. Also, the pattern itself is highly stable and shows barely any motion. Even though there's a central cyclone churning around the pole, its motion doesn't seem to be pushing the outer cyclones to circle around it (a la "Ring a Ring o' Roses"). If they are circling the pole, then they must be drifting very slowly. The other exciting thing about Juno is that it was built to probe the inner depths of Jupiter. One way it does this is by intricately mapping Jupiter's gravitational field to a precision 100 times better than ever before. Every 53 days, Juno carries out a stunning Jupiter flyby. The probe takes two hours to travel from one pole to the other, zipping past at more than 200,000km/h and skimming just 4,000km above Jupiter's cloud tops. These tiny changes in Juno's speed are measured using a kind of interplanetary radar gun; Juno transmits a radio signal of a certain frequency and when it arrives here on Earth, any change to that frequency alerts us to Juno's changing speed. But being made of gas, Jupiter is essentially all atmosphere. By definition, the planet begins when the atmospheric pressure of its gas equals 1 bar. That's equivalent to the pressure we feel at sea level on Earth. Previously what we've seen of Jupiter, the banded belts and zones, are the cloud tops sitting just above the planet's "surface". They circle around the planet, with alternate bands moving in opposite directions. Juno's data has shown that this banding continues deep into Jupiter, appearing to be much more than just a thin layer of weather (that's driven by the Sun). 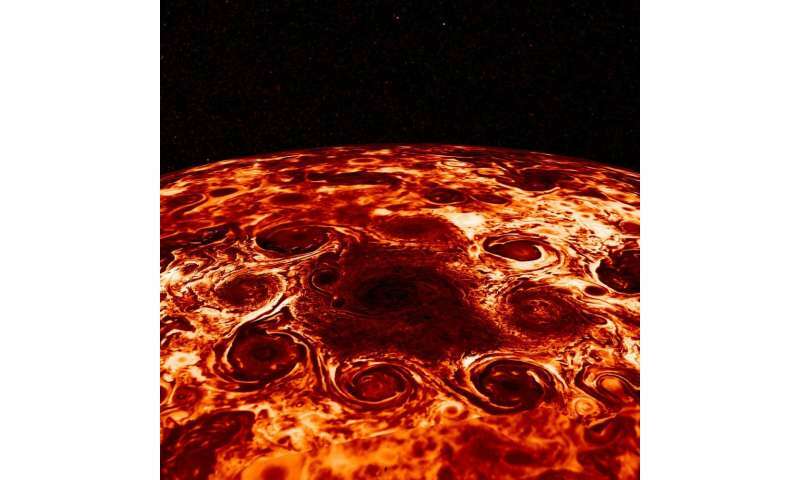 Juno's gravity mapping was separated into two components: a static component, modelled as Jupiter's gas rotating as one; and a dynamic component, arising from flows. The dynamic component was revealed by a north-south asymmetry in Jupiter's gravity field. What that means is that the way gravity varied from the equator up to the north pole was not consistent with how it changed from the equator down to the south pole. It also became clear that these changes in gravity tracked the banded structure of Jupiter's cloud layer. As a result, the cloud tops must extend into Jupiter, becoming swirling jet streams that reach depths of 3,000km. The amount of mass swirling around was calculated to be 1% of Jupiter's total mass – more than triple the mass of the Earth. Is there a 'planet' deep within? By analysing the static component of Jupiter's gravitational field, it was found that there is a point where Jupiter's gas starts to rotate in harmony, like a rigid sphere. At this depth, the pressure is 100,000 times greater than what we feel at the Earth's surface and temperatures soar. 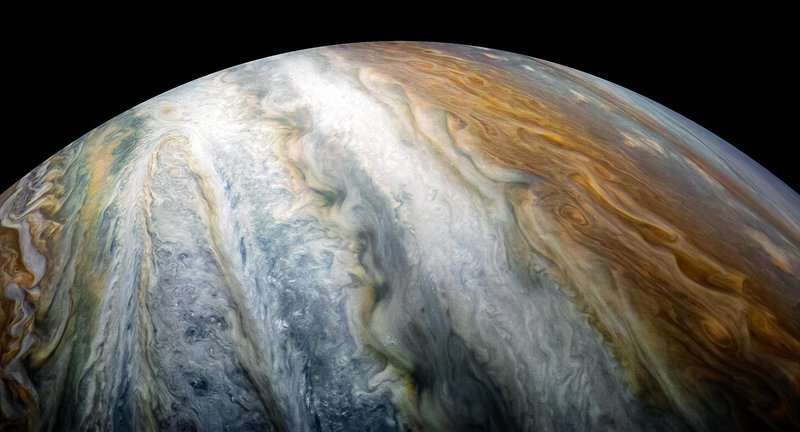 Electric currents flowing through the compressed hydrogen gas and constrained by Jupiter's powerful magnetic field, are thought to slow the winds down and drag the gas into uniform motion. 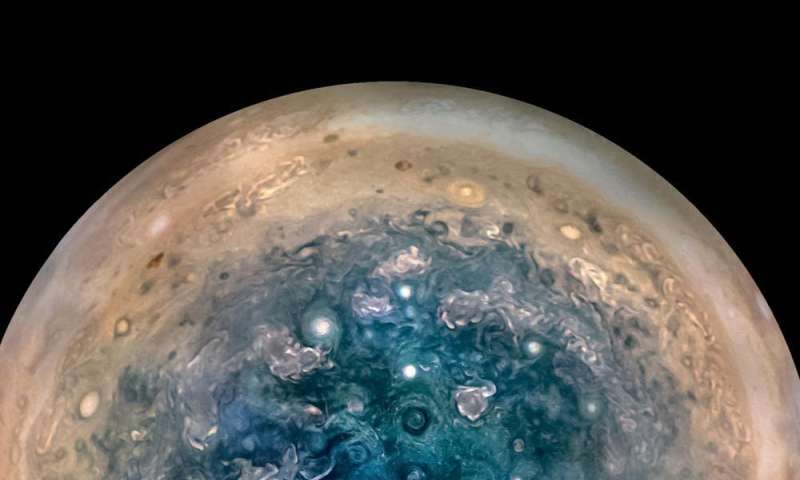 As Juno continues to swing by Jupiter, scientists hope to better understand the dynamo powering Jupiter's magnetic field and ultimately to determine if Jupiter has a solid core, made of some kind of icy rock subjected to more than 50 million bars of pressure. Now that's truly out of this world. The latest Jupiter flyby (from April, 2018) shown in 70 seconds. Credit: NASA/JPL/SwRI/MSSS/SPICE/Gerald Eichstädt.